The following chilling quote is from the convention organizer and party chairman. "With the rise of the Tea Party, the white-right and other racist forces. With gun sales nationwide at an all time high amongst whites, with a mood that is more anti-Black than any time recent, it is imperative that we organize our forces, pool our resources and prepare for war!" Chairman Malik Zulu Shabazz, Esq. Convention Convener and Party Chairman. "...prepare for war!" -- folks, this is crazy talk. I am black conservative, singer/songwriter and tea party spokesperson, Lloyd Marcus. I have attended over two hundred tea parties across America on three Tea Party Express tours. So where did the Black Panthers Party get the erroneous idea that the tea party patriots are as Janeane Garofalo says, "a bunch of redneck racist against a black president"? 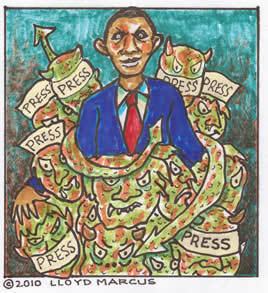 The unfortunate answer is the Obama media machine. As a matter of fact, to kick their "America is Racist" campaign up a notch, the liberal mainstream media embellishes their lie. Liberal commentator Sam Donaldson outrageously compared the Arizona law to Tienanmen Square.